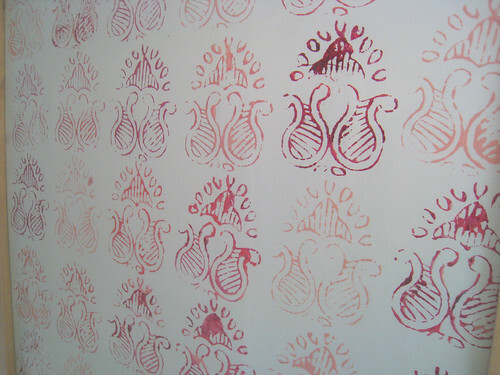 I love the idea of making my own wallpaper using old carved wood printing blocks. Maybe I will give it a try? But you can also use the blocks for cards, making wrapping paper, and art. I found this store that sells on etsy.com and ebay.com. On etsy you can buy 10 blocks for $49 or choose individual version at their ebay store. I used a couple I picked up at Brimfield to make simple artwork for our bathroom in our old apartment (below). Super easy and cheap. I stamped different shades of pink paint onto watercolor paper in a loose grid pattern. 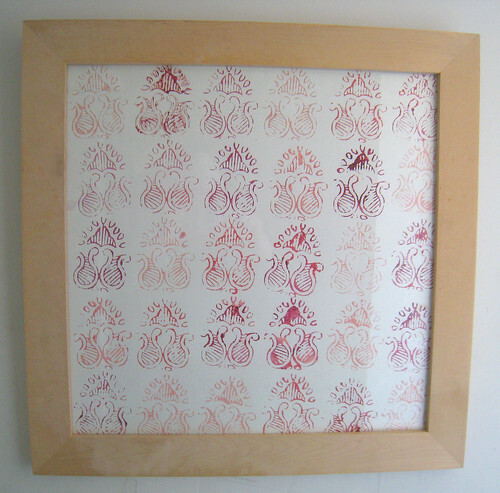 After the artwork was dry I placed the paper into a store bought Ikea frame and hung for a simple display. I would love to make some larger versions that cover a long hallway. The possibilities are endless. Stock up on a few now to make inexpensive holiday gifts for friends and family. What a great idea! I don't know that I would have the patience, but I like the idea of putting it in a frame or maybe doing stripes! Very cool. I love this idea! I'd love to see it as wallpaper. Ambitious. But how personal and great would that be? !